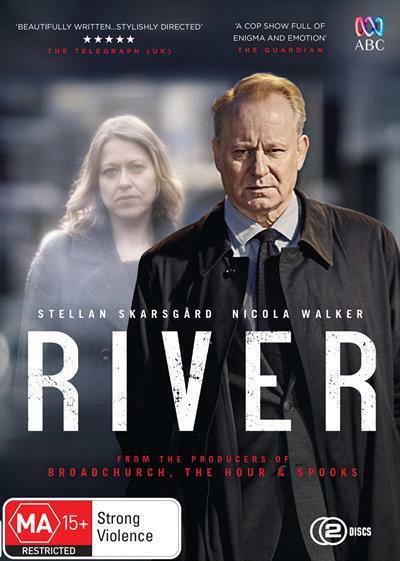 SPOILER ALERT… Fifteen minutes into British crime drama River and you are hooked. River (Stellan Skarsgard) and his partner ‘Stevie’ (Nicola Walker) discuss the virtues of singing out loud and releasing one’s inhibitions, accompanied by a backing track of the 70s disco hit ‘I Love To Love’ by Tina Charles. Here lies the difference between these two partners of the Metropolitan Police Force. River is moody, easily agitated, brooding, not one to talk and open to fits of rage. ‘Stevie’ is fun-loving, says what she thinks and is constantly goading River into expressing his feelings. The affection between the two, though, is clear to see. Oh, and did I mention that ‘Stevie’ is also dead? Don’t for a minute think that this is some kind of The Sixth Sense meets The Bill. The police procedural still plays an important role in the series, but front and centre is Rivers’ slow mental disintegration. Coupled with his frustration and anger at losing a friend are his conversations with what he calls manifests: ‘Stevie’, ghosts of victims, and criminals he has encountered in his job. For good measure, his main tormentor comes from the pages of a book he is reading. Thomas Neill Cream, played brilliantly by Eddie Marsen, is a real-life serial killer from the nineteenth century known as the Lambeth Poisoner and he acts as Rivers’ inner self-doubt. As the series unfolds we learn more about ‘Stevie’s’ dysfunctional criminal family and her past cases that involve illegal immigration. The support cast is exceptional, especially the role of his police shrink and also his new partner, who is thrown into the deep end dealing with River and his ghosts – or demons, as may be the case. Rivers’ affection for ‘Stevie’ is such an emotional trigger within the show and the emotions it dredges up – love, loss, grief and death – drive the series. Definitely one of my favorite programs of the past few years, I’m sort of hoping they don’t make a new series, as this is a perfect stand-alone piece of art.